Today, there are fifteen Giant Pandas in zoos across United States -- cuddly-looking ambassadors of the world's most iconic endangered species. While each of these animals, and any offspring they produce, are technically on loan from the Chinese government at a cost of $1 million per year for each, this wasn't always the case. In 1936, an American socialite named Ruth Harkness heard about pandas and decided that she simply must have one for herself. So, while on a trip to Shanghai, Harkness and a guide marched into the a remote forest and plucked a nine-week-old panda cub from its home in the wild. She then carried the cub, named Su Lin, back home to New York City -- the first time the species had been seen in the U.S.. Naturally, Harkness's ill-gained new pet became a media sensation. Meanwhile, the panda lived with Harkness in her Manhattan apartment, as the New York Times noted, "with the windows of the room raised high to preserve the native Tibetan climate of the panda." 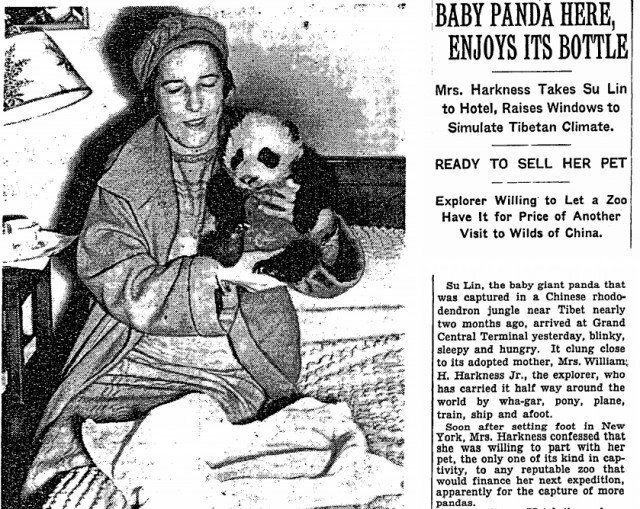 After several months, Harkness agreed to sell the panda cub to Chicago's Brookfield Zoo "for the price of another visit to the wilds of China." During that expedition, she captured yet another panda, returning with it to join Su Lin at the zoo. Sadly, America's first panda died not long after from pneumonia, though the excitement generated by its arrival helped propel interest in a species that continues to this day.